This week we have the Archangels Jeremiel and Uriel to guide us. Jeremiel is the Archangel who assists us in making life reviews and major life changes. Uriel assists us in shedding light on questions we want answers for. The beginning of the week we acknowledge that recent challenges we faced are now behind us. The middle of the week we are guided and reminded that indeed that great idea we have is in fact divinely guided. We also will be able to step out and go beyond where we normally get stopped. And by the weekend with Uriel again saying we are indeed tapped into a great frequency and is asking us to pay attention to continued guidance being given to us as messages with our thoughts as they pertain to the project or situation. It is a week of acknowledging both our recent positive shift and accomplishment and also of our creativity and connection to the angelic realm in having it all come to fruition. 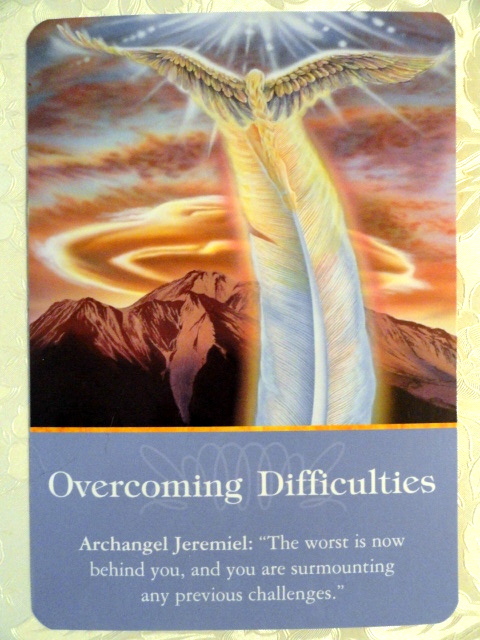 For Monday and Tuesday we have the card, ‘ Overcoming Difficulties with Achangel Jeremiel’:”The worst is now behind you, and you are surmounting any previous challenges.” What may have seemed impossible you have managed to get through and have definitely grown for the better. Your heart has been able to stay despite the circumstances. You have sensed that you are not alone in this type of growth. You actually have been able to be empowered in the difficult situation. This has allowed you to move past these type of obstacles. You are operating at a higher level of vibration and attracting similar frequencies. Archangel Jeremiel whose name means “Mercy of God”, guides you to mercy and all those involved with you. He also directs us and others to act in a more loving manner. With a merciful outlook we’re more able to share with respect and love. For Wednesday and Thursday we havethe card, ‘ Brilliant Idea! 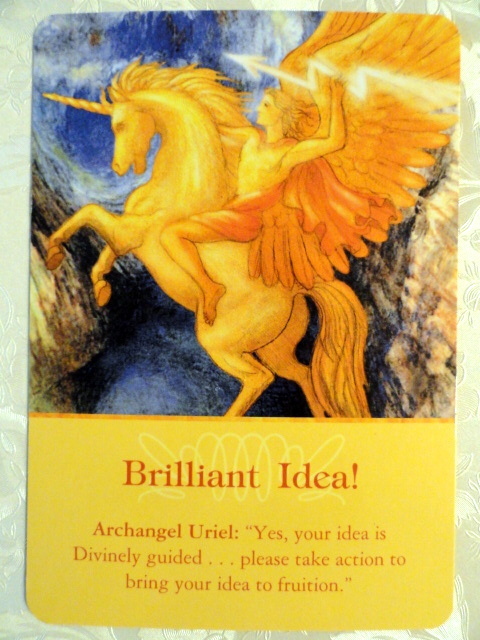 With Archangel Uriel’: ‘Yes, your idea is Divinely guided…. please take action to bring your idea to fruition.’ That great idea you have? It is what you asked and prayed about! Yes, even though it may be a little scary God does not ever give us more than we can handle. You definitely are being asked to swing out beyond your comfort zone. All you need to do is ask and be open to receiving all the support you need to have it come to realization. Archangel Uriel wants you to know that he will be there every step of the way especially if relates to your life purpose. Archangel Uriel’s energy is pale yellow. 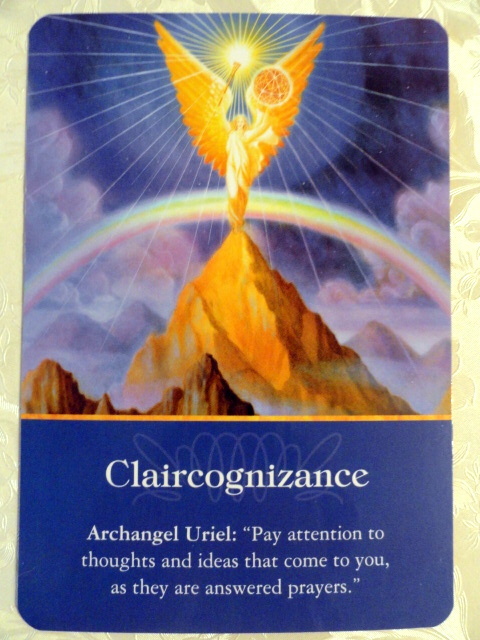 For Friday, Saturday and Sunday we have the card, ‘ Claircognizance with Archangel Uriel’: “Pay attention to thoughts and ideas that come to you as they are answered prayers.’ Here again we are being reminded to notice all our ideas and messages. regarding our health or career. These thoughts especially if repetitive are our answered prayers. Don’t disregard your thoughts and think they are just familiar knowledge or dreams. At this present time your thoughts are tapped into high frequencies and trusted intuition. Most all great inventions, new businesses, and teachings originate from this same universal source of wisdom. You are in tune to this Divine source right now and it’s important to pay attention and write these thoughts down. Then act upon them without hesitation or delay. Archangel Uriel’s name means “The Light of God.” He is known to shed light on our minds with Divine inspiration. You’ll know that Uriel has heard and answered when your thoughts and ideas are loving, empowering and beneficial. Have faith and trust in the messages you receive from him.